council meetings Vector holds with their TSP network each year. 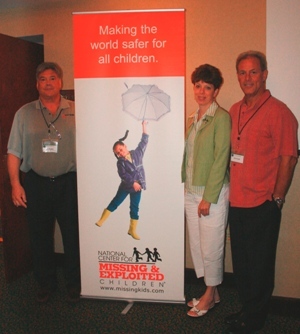 "The support of partners, like Vector Security, that raise both public awareness for the issue and funds to support the search are critical to the safe recovery of missing children," said Ernie Allen, NCMEC president and CEO. "We are grateful for their generosity and partnership." According to Joseph English, Vice President/General Manager of Vector's National Accounts Division, the TSP advisory council meeting is an important purpose of the golf outing, but the first priority is the money that is raised for NCMEC. "We've been dedicating proceeds from this event to the NCMEC almost from the inception of these gatherings. Since both our company and our TSPs serve the retail industry, it's a great way to support a cause that retail itself has embraced." Since the inception of Vector's golf tournament, the event has raised $35,000 for NCMEC. customers and our TSPs. The advisory council was formed in 2008, and appoints members to one-year terms. The council is an important component of Vector's overall Promises Given, Promises Kept (PGPK) CRM culture. The Technical Service Partners play a front line role in meeting and exceeding the expectations of Vector's customers in two important ways: complying with store opening dates and maintaining the operational integrity of Vector's systems.